Are you on a slippery slope on your Winter Sports holiday? How to do it your elf! An alternative to the Elf on the Shelf idea are Kindness Elves, who seem to embody more of the Christmas spirit, and allows much more inspiration and interaction with children. These festive sprites are the brainchild of The Imagination Tree. The idea is that the elves arrive to share the love and magic of Christmas, and their mission is to share kind ideas and notice positive behaviour from the children – rather than report back on less-appealing behaviour. They will be moved somewhere different each morning by their parental assistants, holding little suggestions for nice things that children can do for others in the run up to Christmas e.g. bake some cakes for an elderly neighbour or help wrap up some Christmas presents. The elves can also leave little notes where they congratulate the children for nice things that they have done, like sharing their toys or comforting someone who is upset. These kinds of elves are modelling good behaviour (rather than snitching on the bad) and seem to fit in much better with an ethos of noticing and praising positive behaviour rather than demonising the ‘naughty’. We were inspired to invite an elf to our house to stay and spread a little love and positivity amongst the frenzied run up to Christmas, and help to remind the kids of the true meaning of caring and sharing at Christmastime. The problem we encountered was that elves are so popular this year that they were either really expensive to buy or impossible to track down. 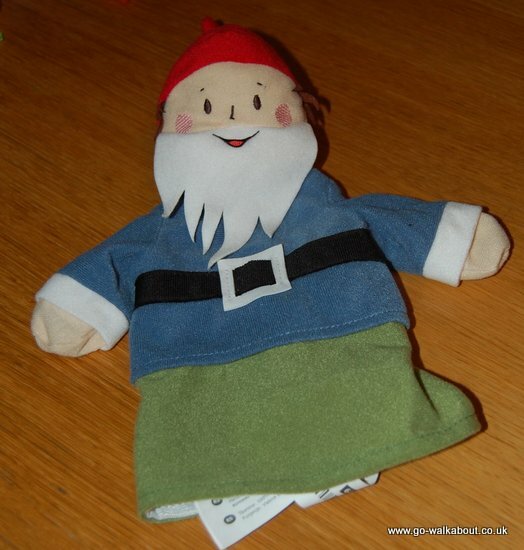 On a trip to IKEA, we discovered that their soft toy elf was unfortunately out of stock but they did still have the Gladlynt glove puppet family, of which there was a male and female hand puppet (there were copious stocks of these!) 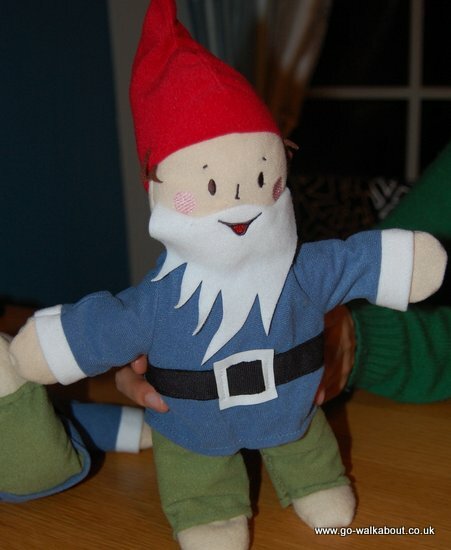 However, they weren’t ideal for using as a visiting elf as they were too floppy (and ultimately legless!) 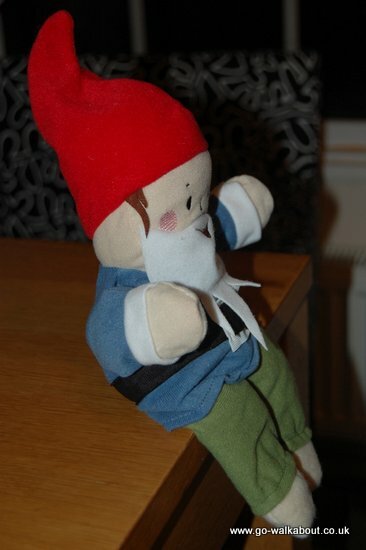 to be poseable or particularly convincing as a visiting elf. 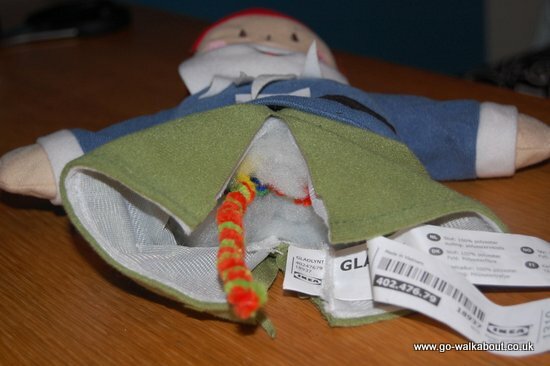 With a great deal of trial and error, the hand puppet was transformed into a bona fide elf using things that most households should have easily to hand (or using things that are easy to find and inexpensive). 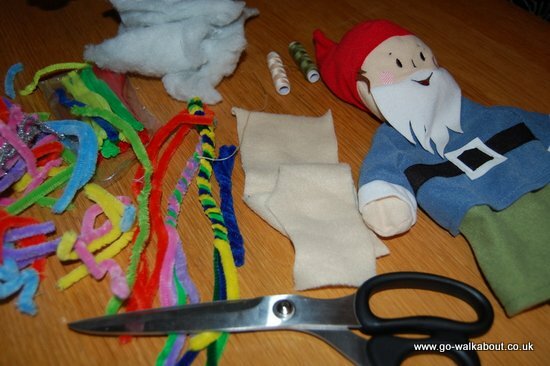 So, if you’re having trouble finding an elf that’s available to come and spread a little kindness in your kingdom, why not have a go at making your own too? 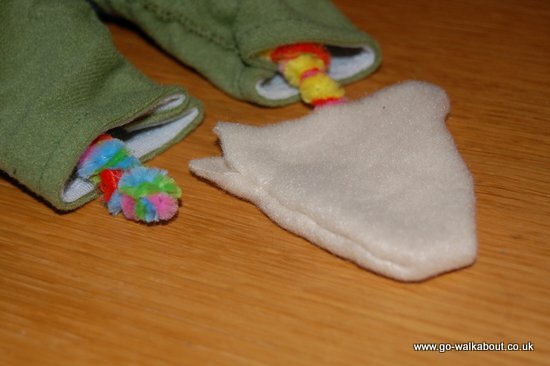 The pipe-cleaners will be used to give your puppet some solidity and movement. 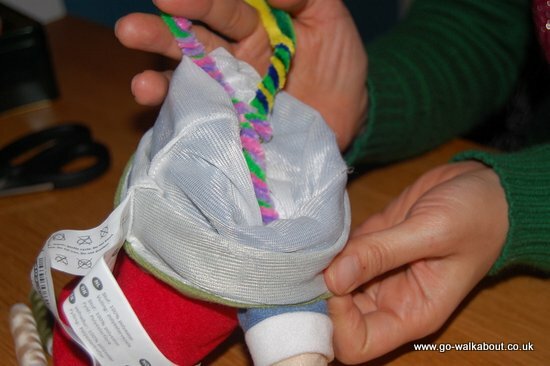 To make the pipe-cleaners thicker, you can bend three around each other, then push up through the body towards the head. Leave a gap at the top of the pipe-cleaner so you can put some stuffing there, so that there isn’t a sharp end sticking out. 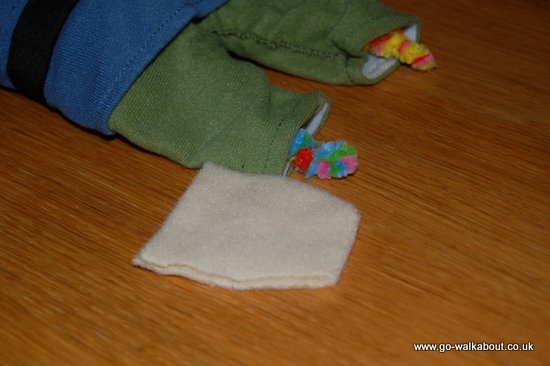 Attach some pipecleaners to the vertical one, so that two arm-lengths are sticking out horizontally to fit into the armholes. 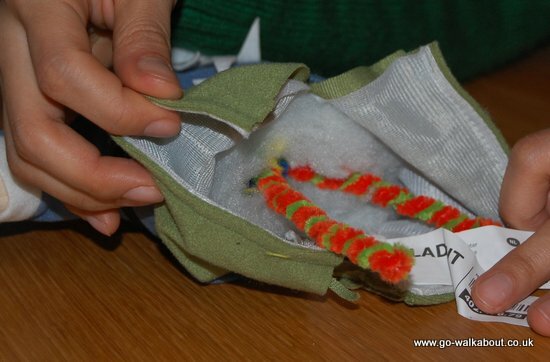 Place these horizontal ends into the armholes. 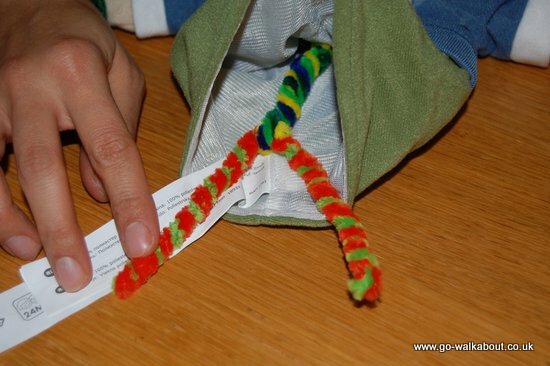 Now measure the length of pipe cleaner that you will need for the legs and feet (using a pipecleaner bent in the middle). 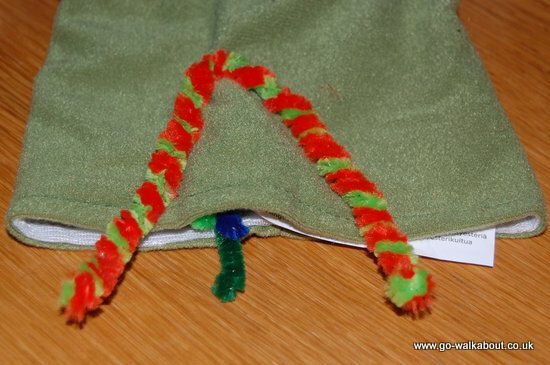 Attach the log pipecleaner to the body pipecleaner as shown. 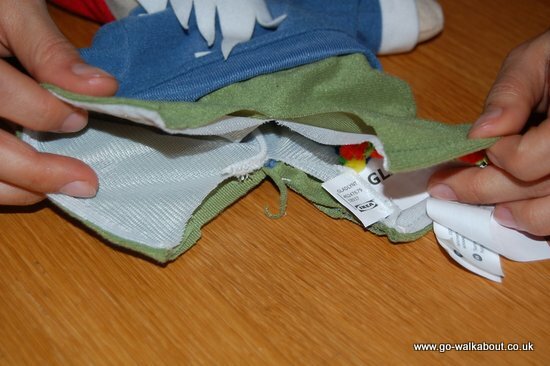 Now make a cut vertically up the green bottom section of the puppet to form legholes. Now stuff the arms, body and legs of the elf, taking care not to put too much stuffing in, as this will make the limbs too difficult to move and manipulate. 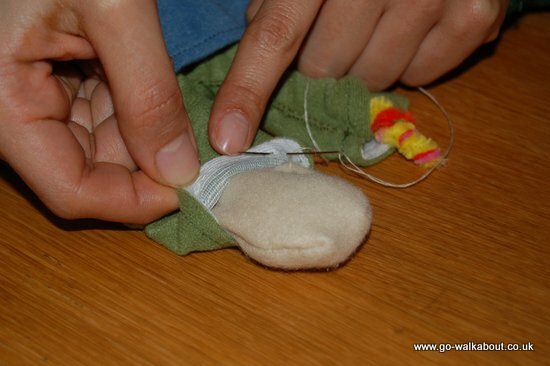 Sew up the legs as shown. 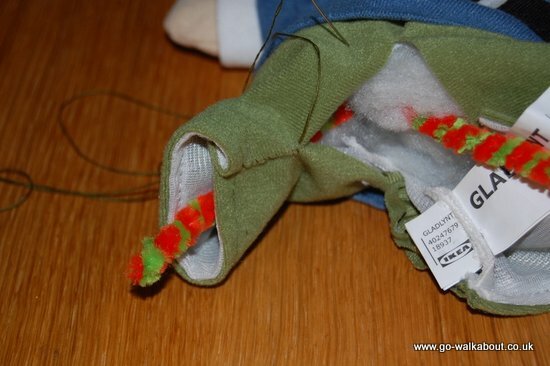 Measure up how long you need to make your feet section, so that part of it can be tucked inside the trousers, whilst some pokes out at the bottom. 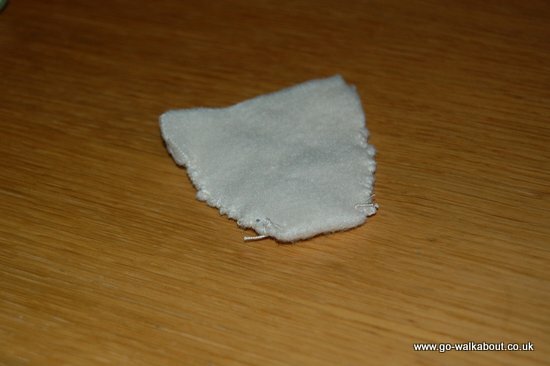 The felt was double-sewn to make the feet, as it is liable to hole or gape otherwise. 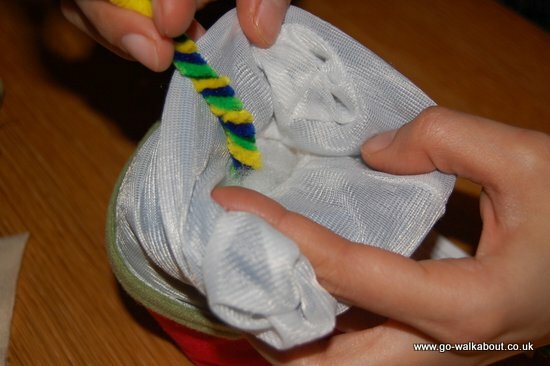 Put the end of the leg pipecleaner into the foot section to check for length etc. and stuff the feet. 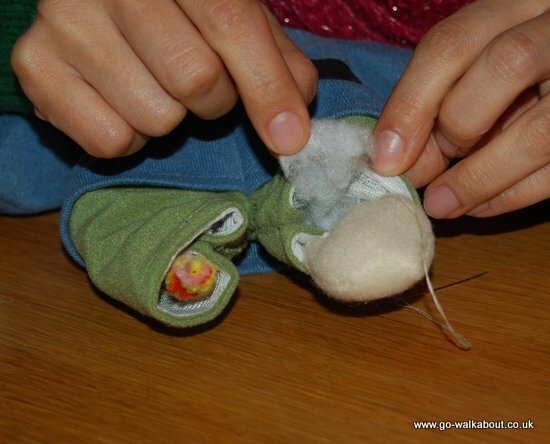 Now sew the feet to the inside of the trouser part, adding more stuffing as you go. There you go! 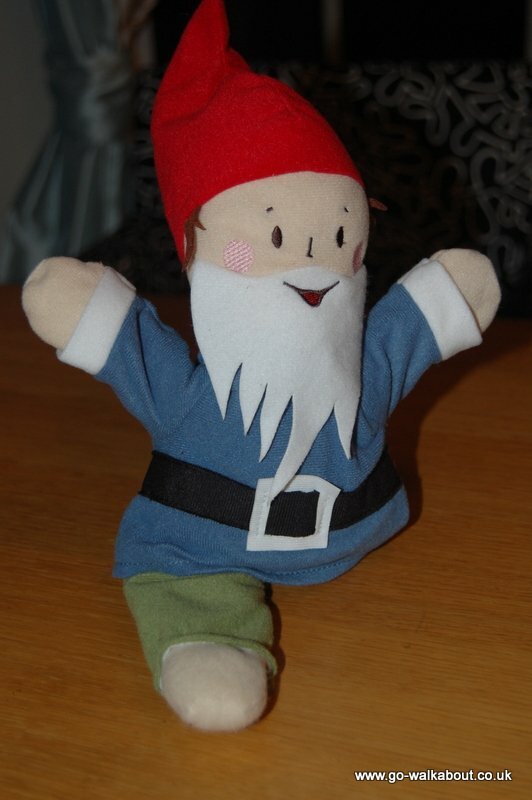 A poseable elf is created from a hand puppet, and your Kindness elf can get to work spreading the spirit of fun and thoughtfulness to children lucky enough to have him to stay. 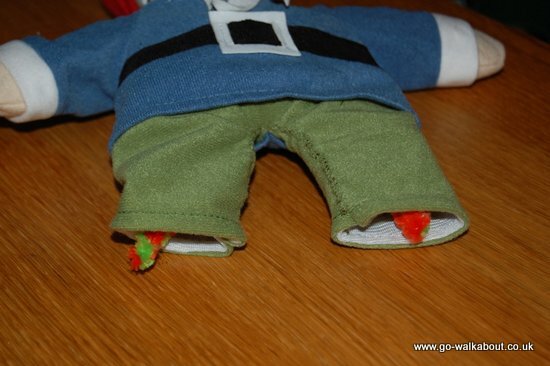 This elf was created by somebody with limited sewing experience, so you could obviously improve upon this method if you have more professional equipment and expertise at your disposal. 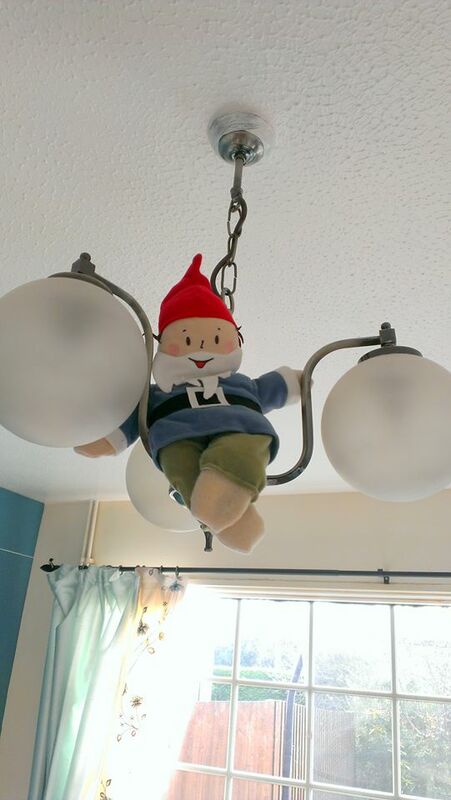 Another thing to bear in mind is that the elf isn’t suitable for young children under the age of 3 due to the potential of small parts. We hope that your creative efforts are successful if you have a go at making one, and that you and your elf have lots of fun making magical memories for children this Christmas. We would love to see your photos of what your kindness elves look like, and also what ideas you come up with to help them spread a little Christmas caring.